13.08.2012 You find an updated version here. 04.06.2012 After a few bugfixes, the current release is now v1.2.3. Fixed a bug that occurred when an identical rule was applied for multiple options in a single choice field (select or radio). This made the rules cancel eachother out. Small update to the function “hideFields” to prevent hiding an empty required field (where the required flag was set in the list settings). Another small update to the function “doReadOnly” to prevent the width of the “formlabel” to vary when toggling readonly for a field. 31.05.2012 V1.1 fixes a possible bug occurring when the Title-field is not present in the form. For example you could have a Yes/No check box determines whether some fields as required or not, or the status selector in a Tasks list can toggle which fields are visible or read only when you change from “In progress” to “Completed”. 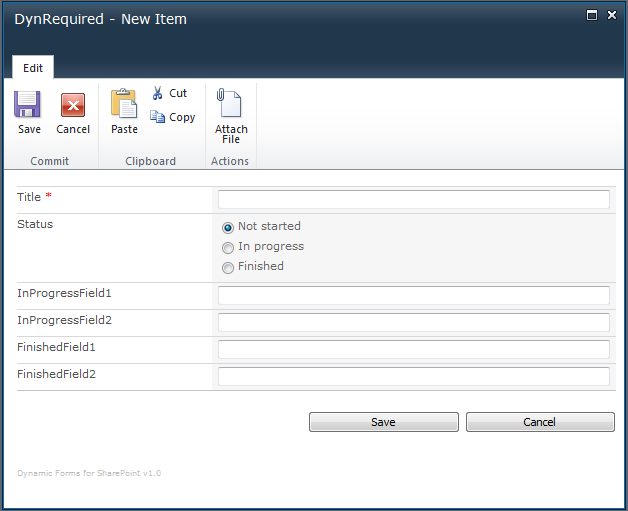 All screenshots are from SharePoint 2010, but this solution is designed for both SharePoint 2007 and SharePoint 2010. I have tested it in IE7, IE9, FireFox 12.0 and Google Chrome 19.0.1084.52, but not extensively, so please let me know if you experience problems. I have previously posted a BETA version of this solution, but I have finally updated the Dynamic Forms for SharePoint solution to a “production release”. You can use a date column as trigger – though only [today] will work in this version. Rich text column validation now works. You can check for group membership and execute rules if a user is NOT member in the group. No more problems using “is not equal to”. This article will walk trough the features and the setup of the updated version. I have added this as a separate article to keep it tidy. 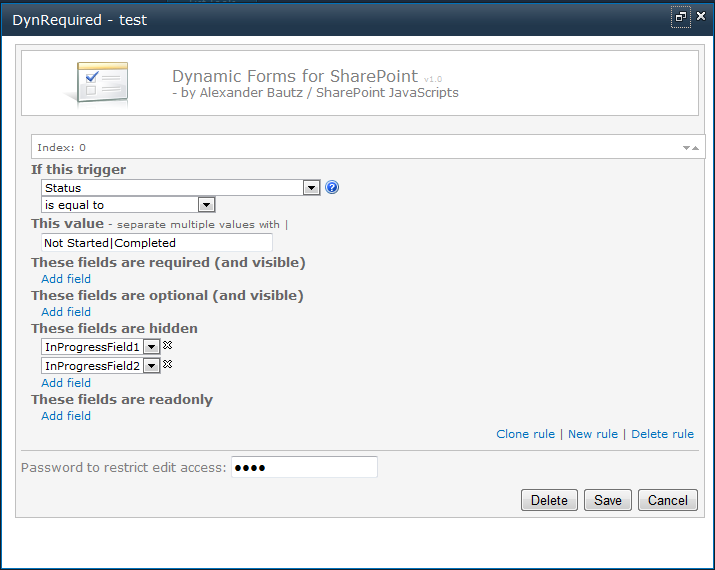 Download the file “DynamicFormsForSharePoint.js” and “spjs-utility.js” from here. Please note that you will need the version dated 18.01.2012 or newer of “spjs-utility.js”. You find the files in folders with corresponding names. You also need jQuery – download it here. You may use the latest version, but i prefer v1.6.4 as it is faster in some areas. You can not use jQuery versions below 1.6. Please note that not all of my other solutions will work with jQuery v1.7x. Put these files in a document library or a folder created with SharePoint Designer. Ensure all users have read access to this location. This solution is set up by referring a script from NewForm, EditForm and DispForm of the lists where you want the solution activated. Press Enter and you should be able to add a CEWP to the page. Put the CEWP below the form web part. In the list view, click “List” on the List Tools menu. Then select “Form Web Parts” and pick the form to add a CEWP to the page. Put the CEWP below the form web part. I recommend using the Content link option in the CEWP to refer the code like the example below. The CEWP code should be put in a text file (txt) or an aspx file like in the example below. This file should be put in the same location as the file “DynamicFormsForSharePoint.js”. You could also put the code directly in a HTML Form web part as this web part is handled in a slightly different manner in SharePoint 2010, and therefore does not mess with the script generated HTML. You must change the script src to all files so that they refer your local files. These three scripts are all that goes in the CEWP – all configuration is done in a graphical user interface. When this solution is first setup in a site, the configuration list is created automatically. This list is not to be hand edited, and it can be hidden using SharePoint Designer if you like. When you configure the solution for a specific NewForm, EditForm or DispForm, the configuration is stored using the site-relative URL of the form as an identifier. When a user loads the form in a browser, this configuration is read from this location and the rules are applied “on the fly”. If you set a field as required in the list settings, and then hides it due to a rule when it’s still empty, the user will not be able to save the form. You click this text to enter the configuration. Note that this text number is visible only if the solution has not yet been configured for that form, or the logged in user is the one that configured the solution for this particular form in the first place. This dialog is bypassed if a password has not been set. Note that in DispForm, the only configurable setting is “These fields are hidden”. Hover the mouse over this image in the GUI to get some hints on how to set up the rules for each field type. Yes/No, Drop-Down Menu, Radio Buttons, Checkboxes (allow multiple selections), Single line of text, Number, Currency and Date and Time. Not all operators can be used for all field types. To configure a rule for a field of type “SPFieldBoolean” (Yes/No checkbox), you must enter a different value in NewForn / EditForm than in DispForm. In NewForm and EditForm use true for checked and false for unchecked. In DispForm use whatever text value representing “Yes” and “No”. Note that the operator dropdown is disabled. To find the group ID, go to Site Actions > Site Settings > People and groups and click on the group name. If you are updating from v0.9.1 or v0.9.2 I’m fairly sure all you have to do is to enter the configuration for your form, and save it again. I might be wrong, so post any bugs below. Post any bugs or feature requests below. 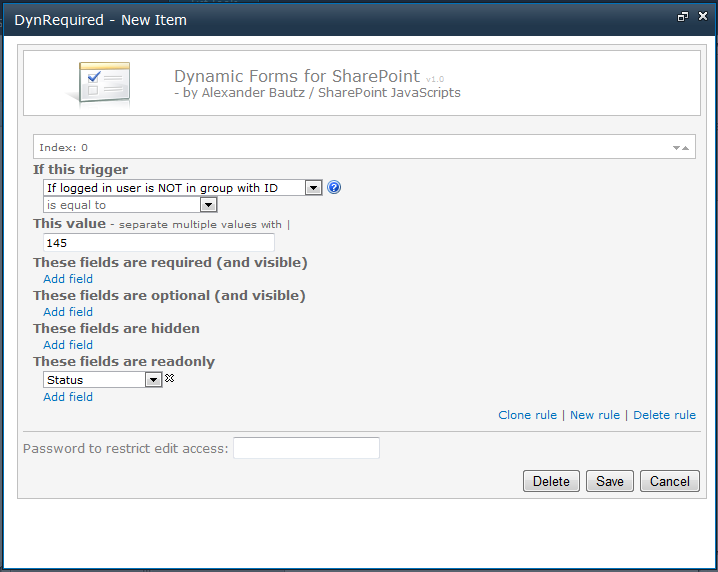 Hi Alexander, did anything in your code change that would make this compatible with your Tabs for Sharepoint Forms solution? Thanks so much for all you do! I’ll try to add compatibility in future releases, but this one in no different then the BETA version. Love your solutions, they are fantastic! Anyway, I just started implementing your beta, v0.9.2 and it was working, but was having issues and could only use “is equal to”, also it would give me a null error if I used more than 3 rules. I switched to your version you posted on the 29th but now it does not give me the ability to set required fields, read only… Am I doing something wrong? You can not set an EMPTY required field as read only as the field has to have a value for the user to be able to save the item. This is only true if the field is set as required in the list settings. If you use this tool to set it as required, the required-flag is removed when the field is set as readonly. Sorry, I don’t think I explained it correctly, and I know you are very busy. I have a screen shot I can send. But what is happing now for example in new item I only see these fields are hidden, there is no option for Theses fields are required, these fields are optional… And no matter what I put into the “These Fields are hidden” they still show? I do apologize, but not sure why the older version worked but not this one. I am using the current files as specified? Hi Alexander, Just thought I’d share since you asked for feedback. My scenario involves v1.1 and a dropdown list box. I’ve configured three respective Eq rules that hide fields. Since moving to v1.1, I’ve experienced consistent unwanted behavior. At first view of the newform page, rule 0 works. Once I start clicking dropdownlist items, rule 0 no longer works, rule 1 doesn’t and rule 2 does. Of the three rules, whatever configuration is in index 2 works while the others do not. Since rolling back to v0.9.2 its been smooth sailing. Obviously too little testing and a few trailing errors from other changes. I’ll fix it and publish it later tonight. Could you try with v1.2? v1.2 did not fix the problem I have been experiencing. My test case is very basic. Three One DropdownListbox Eq rules that manipulate one field by either setting it hidden, read-only or required. Jumping between v0.9.2 and v1.2, the same array of rules yield difference renderings. My observation remains that rule index 2 renders as expected, while index 0 and 1 do not. I do hope my feedback is helping because it’s really all I can do to help other than buy you beers… I just want to gain access to my pay-pal account before that can happen, and it will. Cheers! I really appreciate your testing of this solution as I would like it to get it right. bug occurred when an identical rule was applied for multiple options in a single choice field (select or radio). This made the rules cancel eachother out. I have made a fix that will prevent this error, but remember that the solution is designed to take multiple values in the “This value” field when the rule for the values should be identical. Please let me know if you still experience problems. The issue seems to have been resolved. Thank you, and cheers! I can’t seem to get this to work when using a custom Edit form in SP 2007. Am I doing something wrong? 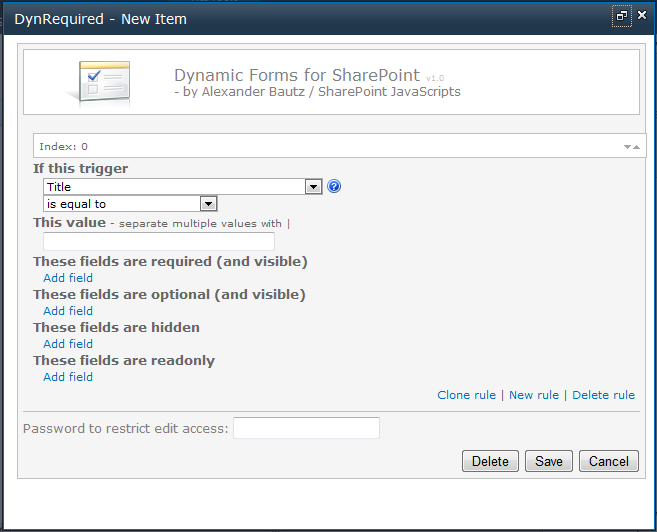 I added a new SharePoint customer form within SPD, and then hid the old edit form. Now I’m adding in the CEWP, and it shows up, the status bar shows “Please wait while scripts are loaded…” but nothing ever happens. I’ve also tried manually appending dfsetup=1 after the base URL, and nothing. Is that error indicative of anything specific I could check? I managed to introduce a bug in v1.2.2 that causes this error. I’ll fix it and try to post an update as soon as possible. v1.2.3 should fix the problems – sorry for the inconvenience. It seems as though the tool is not pulling back any of my forms fields? Is this something you’ve seen before? Any solutions? Have you put the CEWP below the form web part and are you using a standard SharePoint form (not customized in SPD)? Thanks – did need to put them below the List. Now I get the following web page error which when I click on it means I’m unable to save. Any ideas? Ensure you have the correct version (latest) of spjs-utility.js, and that all script paths are correct – and ensure you have the latest version of ” DynamicFormsForSharePoint.js “. Yep, all the latest files referenced correctly and below the form web parts. This is now conflicting with SPServices from Marc Anderson. Sorry, I forgot to answer your comment. I have added this change to the new version I’m working on, but forgot to update the one published here – see v1.26 for the change. Always appreciated your excellent work!. I upgraded to the latest version of Dynamic Forms (v.1.2.3), but it seems that boleeans (Yes/No field) are not working anymore. I set the value ‘is equal to’ ‘true’ in NewForm, but nothing is happening when the box is checked. I tried with required and hidden fields, but nothing is changing. Am I doing something wrong? I’ll look into this later tonight – stay tuned. I have obviously missed this bug in several updates – it should be fixed in v1.24. Could you test it and report back? On second thought – I might need to tweak it a bit more to support DispForm. I’ll post back later tonight. My mistake – it works. It seems to be working now! Great work and thank you for the quick solution! Any ideas as to what to use instead? This issue should be fixed in v1.25. Love th escript, everything is working great! I do have a question, can you use the Dynamic Forms on two different lists that are not associated with each other within the same site? Yes, You can use it in an unlimited number of forms. The configuration is identified by the unique URL of each form. Great update! I’m trying to use the “If user is NOT part of this group” function and it seems to be conflicting with the accordion display. (The accordion display and the dynamic forms webpart work flawlessly otherwise) The read only fields are displaying correctly how ever the hidden fields are showing unless i go into edit mode and then exit edit mode. it doesnt seem to matter which webpart is ontop either. The accordion and the tabs solution will not play nicely with this solution as both show and hide fields. I am however working on a version which combines the tabs (and maybe the accordion) functionality with the dynamic forms solution. It will be about a week until the BETA of v2.0 is released. Ok. I’ll keep a look out though its strange that the hide function only messes up with that function. I dont have any other problems hiding fields with that combo. Its not that the hiding of the fields does not work, but that the two solutions addresses the same fields and interfere with each other. Let’s say your accordion “button” specifies that the “Status” field should be hidden, and at the same time you have a rule that says “if the Title field is empty, set the Status field as mandatory and visible”. If the Title field is indeed empty — which solution wins? I was mistaken it didnt work in the other scenarios either. You make total sense. Any update as to the status of the combined tab/dynamic form solution? I didn’t get time to finish it last week, but i hope to be able to release a beta version during this week. Ok awesome! i’ll be more than happy to test that out. I have several fields that are not being picked up as an available trigger. Does this not support “Lookup” type fields? Sorry, but Lookup columns are not supported as triggers. Love this add-on. However, I need a solution that would allow for a compound If statement or one that could possibly use a calculated column. I actually have two fields I need to check before deciding which formt to present. One of them is a status field which would have all fields as not required if in draft mode and the other field would determine which questions would be displayed regardless of status. I thought I could figure this out using a Calculated column but apparently this does not work with Calculatredc olumns. Is there anyway to add that to the Dynamic Forms? Sorry for the late reply. Calculated columns are not available in NewForm / EditForm. I could allow for calculated columns in DispForm rules, but this might not help? I love your scripts… Does this work on sharepoint surveys? Have you put the the CEWP below the form web part? Seems this fails with IE8 – I had put in the solution some months ago and everything was working fine, but as soon as my company switched to IE8 it started giving “error on page” and would dump the value in any People Picker fields. I couldn’t even edit the page in SP! I had to go into SPD and remove the EditForm CEWP that way in order to get around the Error on Page bit so people could save. I would need some screenshots of the “error on page” details – double click the exclamation mark to see the details. I”ll be away for a few days now, but will try to look into it when I come back. Looking forward to the update! Can you manipulate the OK button of a form like you do columns? Yesterday, someone asked if I could hide/disable the OK button based on a rule… can that be incorporated into DF? Yes, see v2.0. Follow the link in the top of the article. Everythings set-up correctly; user are restricted from viewing the specified fields. When the user first enters the list template they do not see the restricted fields. But after they hit ‘save’ they the fields become unrestricted and are not hidden. How do I keep the fields hidden after the list template is saved. Not sure I understand. Is it a validation error that unhides the field before the form is saved? Or do you save the list as a template? Hello Alexander. Is there a way to use this scpipt in custom forms? With nomal forms it works. I love this solution, but for some reason when I use the solution on a list with multiple content types, it shows a Content Type drop down on the EditForm when I have set all other fields to read only. I don’t want this to show up, yet there is not an option to hide it. Please help! Sorry for all the emails, any way you can do this and incoporate a pre-fill of fields (hidden or visible)? This unfortunately conflicts with SPUtility that allows me to pre-populate a field. See v2.0. Follow the link in the top of the article. Great script! Not sure if anyone else is having this problem but when a column is set to read only the description of that column is not visible. Thank you for your great work! I have added the description to the read only fields in v2.0. Follow the link in the top of the article. Where may I see a demo or actual implementation?? I downloaded your script and used it on my site. Looks great, but somehow I cannot create conditions because in trigger I cannot see the columns from my list. How can I add the columns from my list to the trigger? Thank you! That worked! You are brilliant! Can we use two different content types in the same list and use this solution for each content type? The content types would be child of OOB List Item content type, just with different columns. I was wondering if the tab solution will work with external list. A great framework you have developed! Normally you have the same setup on DispForm, EditForm and NewForm, especially for tabs. It would be great if you could connect one and the same configuration to all 3 types of forms. So you don’t have to make the same changes to all 3 of them. For example by making it possible to specify the Title in the configuration list as just /Lists//, i.e. without specifying the last part which is the name of the form page. And such a configuration should match all form pages that start with that URL. …specify the Title in the configuration list as just /Lists/List Name/, i.e. without…. so this has been incredible for me. One thing I can not seem to do is make it work on the edit form of a library. Is this a limitation? I can see and access the dynamicforms but when i tryto save anything at all like a tab i created i get “the operation failed because an unexpected eror occured. (result code: 0x80070005) I have full control permissions over the ibrary that the JQ library sits and the site list. Any ideas? There is no limitation, it should work in a document library. The error code you refer indicates access denied. Thanks. I added myself as the SCA and it all worked great. thank you for your quick reply! For the Membership group… we have Windows security groups that are embedded within the SharePoint security group. People in those embedded groups are not being included in the Logged in user is NOT is group ID. Any ideas? Sorry, but I have no solution to that issue. As far as I know all users must be direct member of a SharePoint group to use this feature. I am implemented the above code, but its no showing me bottom left corner link. So entered dfsetup-1 at the end of the url, now form comes. But when I tried to field, its showing me blank dropdown, there is no any field in that drop down. Sorry for the late reply – still having trouble? concerning this article, while I am also eager of getting know-how. This is amazing. Very excited to try it out. The version in the js file is – version:1.182,versionDate:”April 21, 2014″. The version of the ddfs is v3.310. Could it be that you have loaded spjs-utility.js another place in the page? Your version of DFFS is also a bit old – not sure if this has anything to do with it though. Can the dynamic forms be saved within the list template? In other words I am creating a list to beta, once completed, I want to pick it up and move it but I don’t want to recreate all of the rules. I appreciate the feedback. This is not possible, but if you save the site as a template it can be included.